MIT News features Dr. Cissé's reasearch in the "Transient Contacts" article posted by Bendta Schroeder, School of Science on December 1, 2014. It was announced in October of this year that Dr. Ibrahim Cissé was a receiptient of the National Science Foundation New Innovator Award. Cissé graduated school in physics here at the University of Illinois at Urbana-Champaign under his PhD mentor, HHMI investigator Taekjip Ha, a physicist who has been pioneering single-molecule imaging techniques. While he did not have a great deal of experience with cell biology at first, he was fascinated by the idea that some of the same principles he studied in Ha’s and Chaikin's labs could be applied to unexplored areas in biology. 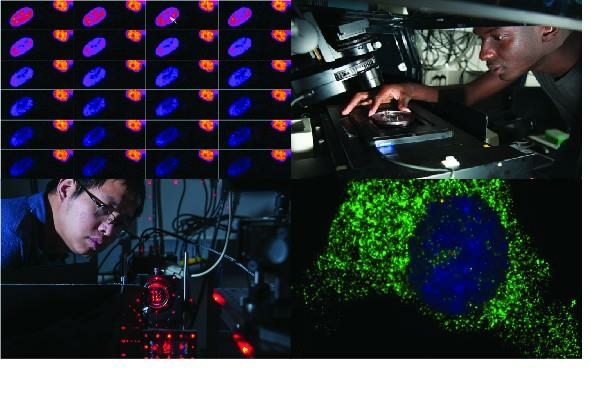 Highlighted in the story is Cissé's use of tools from physics to illuminate the transcription process at high resolution. He has adapted a new fluorescent imaging technique called photoactivation localization microscopy (PALM). PALM activates fluorescent tagging proteins at random and then applies a statistical algorithm to determine the exact location of each protein with nanometer-accuracy within the pixel of light. When Cissé repeats the process at high speed and volume, he can map the precise location of tagged biomolecules as they cluster at a transcription site or trace the path of a single transcription factor as it moves across the nucleus.